From wood to vinyl and all materials in between you can be assured of a reliable fitting service by our team who work to the highest standards. Flooring comes in a variety of textiles; carpet, tile, hardwood, laminate, parquet, vinyl and linoleum. 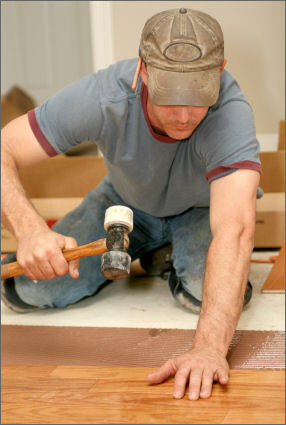 Installing carpet requires specialised tools, a lot of time and is hard on your back and knees. Laying tile leaves the option open for creativity, designing a basic pattern or mosaic with different shapes, colours and tile sizes. Hardwood floors are the more traditional and will last for many years. Parquet, laminate, vinyl and linoleum floors are usually more affordable, creating a unifying look for the space. These types will usually involve the use of toxic chemicals, so it is advisable to have the area free from family members whilst the work is carried out. Preparation includes: removing previous flooring, cleaning, hoovering and making good, prior to laying your new floor. London Handyman Services have floor restorers who really understand deep down how best to restore and revive a floor to it's former glory. It was indeed a pleasure to work with London Handyman and specifically, your handyman Terry. He was not only professional and knowledgeable about the projects that needed to be completed but also extremely cooperative and most helpful.